While Christopher Columbus’ name may be associated with the proliferation of chillies throughout the world, the birthplace of these tasty, spicy pods is in Mesoamerica, a region that begins in Central Mexico and sweeps down across Central America and reaches into the northern part of Costa Rica. 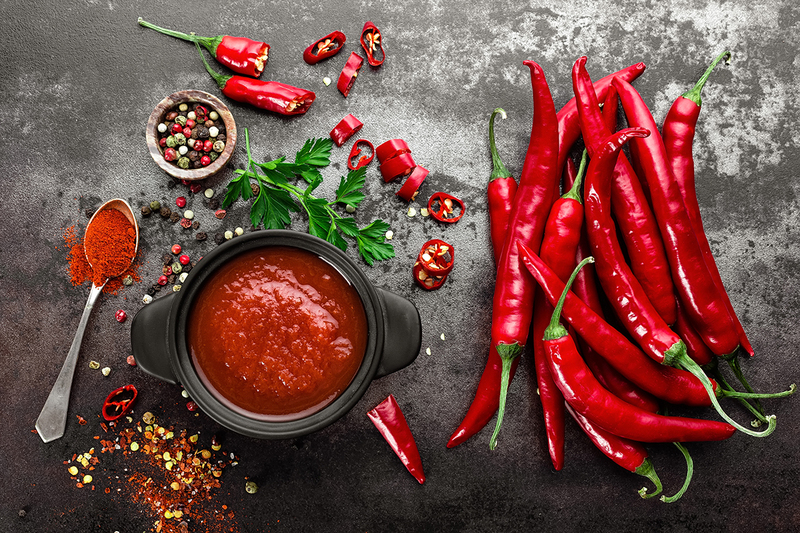 Chili peppers were an important part of Mexican traditions, particularly in the cultures of the ancient Mayan and Aztec, long before Columbus traveled to the New World. Chilies were highly valued for many important roles including medicinal purposes, home fumigation and, of course, to add a flavorful zing to just about any food you can imagine. Archaeologists have discovered that fully domesticated chili peppers date back all the way to 5000 BC in Mexico’s Tehuacán Valley, where native tribes enjoyed them in their everyday lives. The term ‘chili’ is derived from an ancient Aztec language known as Nahuatl that has provided many words for modern-day Mexican Spanish. 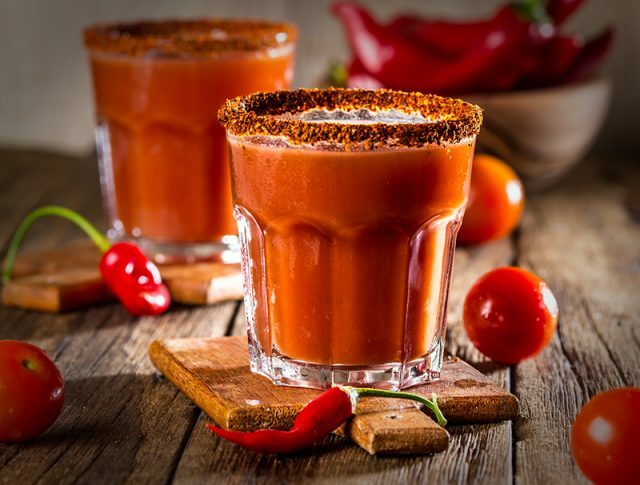 One of the fascinating things researchers have discovered is that there was a clear relationship between chili peppers and the beverages consumed in ancient Mexico. In the southern part of Mexico near Chiapa de Corzo where the Mixe-Zoquean culture has long dominated, ancient pottery including drinking vessels have been unearthed at local archaeological sites. These vessels have been chemically analyzed by scraping a tiny sample from within each one to tell researchers more about what they would have held. They found that several vessels held traces of dihydrocapsaicin along with other irritants that are part of the Capsicum species that includes chili peppers. Researches believe that most of these vessels probably held drinks but could have been used for spicy salsas as well. This particular evidence confirms that chillies were an ingredient commonly used in beverages dating back to 400 BC, which is the oldest documented use of chillies in spicy drinks in Central North America. 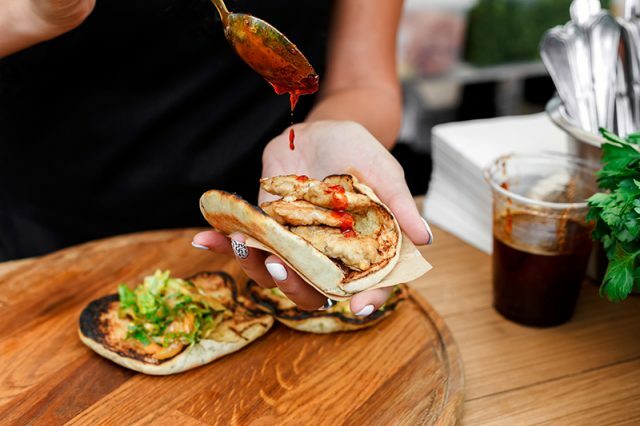 Female street vendor hands put ketchup sauce in taco outdoors. Mexican cuisine snacks, cooking fast food for commercial kitchen. Thankfully for our taste buds, throughout the centuries chilies have evolved in Mexican cuisine to become an essential ingredient in countless dishes. Whether they are used to add a spicy kick to a variety of salsas or are the main feature in entrees such as chiles rellenos, chillies offer a unique combination of delicious flavor and addictive heat that fans can’t get enough of. The Mexican hot chocolate enjoyed today definitely is inspired by the ancient concoctions first made with liquid chocolate made from cacao mixed with chillies. Since there are so many chili varieties (more than 150! ), their range in heat and flavor allows just about everyone to get in on the delicious action of eating them in scrumptious meals and snacks. Chillies have clearly played an important role in the cuisine of Mexico for centuries, from ceremonial fare to everyday meals. Make sure you savor their spicy taste during your next Mexican meal! Previous PostWhat is “Real” Mexican Cuisine?